Mix mayonnaise, cumin, salt, cinnamon and honey in medium bowl. Stir in beans and celery. Spoon about 1 1/2 tablespoonfuls mixture into each taco shell. Sprinkle with cranberries and cilantro. Prepare the taco filling 3 to 4 hours ahead of time, and refrigerate. Chop the cilantro and refrigerate. Ask a family member, or a guest who has arrived early, to help fill the mini-shells at the last minute. 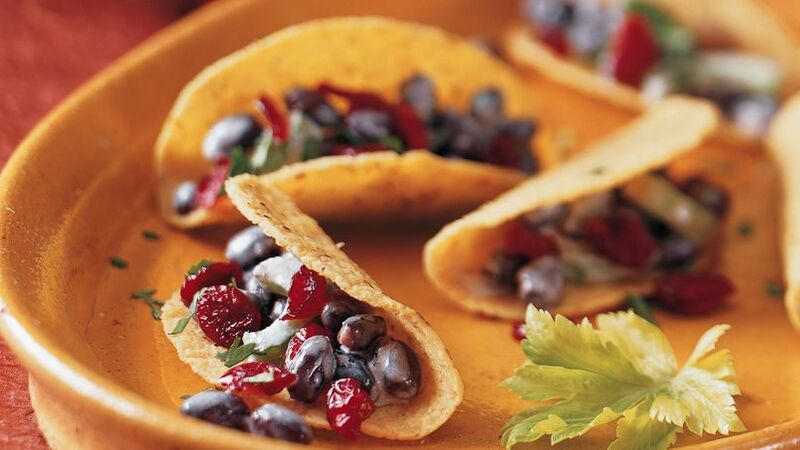 Serve these mini-tacos on a piece of southwestern pottery to highlight the south-of-the-border flavors of this appetizer.